Constantine, such a unique figure that almost everything evolving him looks good. Here is Ian Rankin's take on Constantine's story and I have to admit that it felt much more like Dylan Dog's (apart from some dialogue and the shortage of Groucho, of course). Being black and white is just reinforcing that feeling. It could be said that this is a satire, one more look at the ubiquitous reality shows, but it is rather shallow view, with story filled with holes and cardboard characters. Even the faces drawn by Dell'Edera from time to time get strangely distorted lines, like even he didn't care enough. 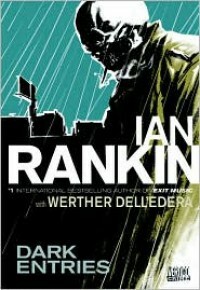 There are couple of powerful pages where completely black frames leave strong impression, but it is not enough to cover the pure plot and even worse resolution - of all the things in Hell, it seems that the worst for Rankin was cannibal who, on top of that, is after a bunch of already dead people... It is rather adequate that he is being dismissed with the remote control, just like a bad program on a TV, but it still cannot compensate for the time spent watching it.